April 8, 2017 marks the bicentenary of the birth of one of the most eccentric and enigmatic geniuses that ever lived. Charles-Édouard Brown-Séquard was born exactly two hundred years ago, as I write this eulogy, and lived a life that is unmatched in terms of fame and fortune, scientific achievement, academic posts and honours, pioneering research, and field-changing discovery, counterbalanced by hardship, displacement, ridicule, penury, racial discrimination, political persecution and personal tragedy. Brown-Séquard is best remembered for his description of hemisection of the spinal cord which he first observed in sugarcane harvesters’ injuries in his native land, Mauritius. The Brown-Séquard syndrome describing hemicord section is well known in neurophysiology; that single discovery alone is enough to grant him immortality in the annals of science. His name is known to every student of medicine; that makes him the world’s most famous Mauritian, bar none, yet, very little is generally known about him. The fact of his Mauritian origin is lost in his nomadic track-record spanning the globe. His harlequin-chimaeric double-hyphenated name is often mistaken for that of many scientists, aptly perhaps because his corpus of scientific work is correspondingly huge. Less known than his eponymous syndrome, however, is the fact that Brown-Séquard went on to provide solutions, and further controversy, to many of the burning questions of the time, immeasurably advancing knowledge in neurology, and pioneering the field of endocrinology even at the cost of his scientific credibility. Unfortunately, his numerous scientific contributions remain drowned by the flood of disrepute that tainted the waning years of his career. Brown-Séquard was a prolific researcher; he published over 575 papers and helped found, edit and populate three journals. Perhaps his greatest achievement was the understanding and experimental validation of the importance of the adrenals to life. He amplified Claude Bernard’s concept of ‘internal secretions’, into what we call hormones today. He promoted the use of bromides in epilepsy and furthered understanding thereof. His discovery of the vasomotor nerves explained away Bernard’s “calorific” fibres. However, he was an experimenter first and a post facto theorist; it is sometimes difficult to fathom what some of his bizarre experiments were seeking to prove. Though Brown-Séquard did propagate a number of ideas that, with our perfect hindsight, appear flawed or plain ridiculous, we need to understand the context in which he experimented and theorized. Genetics, hormones, evolution, blood groups, antisepsis, were all in the future. Microbiology and surgery were in inchoate infancy, and physiology was a miasma of humours, vapours and galvanism. Brown-Séquard fostered faulty ideas about the inheritance of acquired characters, notably traumatically induced epilepsy and weakness in rats. His unconventional ideas about cerebral localization, especially with regard to aphasia, opposed the cluster theory championed by Charcot; he preferred a dynamic model that assumed widely scattered cells serving the same function being connected by nerve fibres. Nonetheless, he stimulated much constructive controversy and counter-research among his peers, acquiring a formidable reputation such that stalwarts of the day, including Pasteur, Darwin and Huxley, sought his academic opinion. Euphemistically a citizen of the world, Brown-Séquard never seemed to find a home anywhere. His career can be graphed only by map vectors and timelines. He crossed the oceans over sixty-five times, spending six years of his life afloat, shuttling restlessly among five countries and three continents. He occupied four university chairs, refused four more, and outlived three wives. He worked and taught at Boston, Harvard, New York, Richmond, London, Paris, Geneva, Dublin, Glasgow and Edinburgh, with occasional impulsive homecomings to Mauritius. It appears that the scientific institutions of the world wanted him and disliked him in equal measure. His prospects of advancement in France were hampered by his being nominally British; moreover, the mixed ancestry of his mother showed in his swarthy complexion. As a Republican he railed against the accession of Napoleon III in 1852 and, fearing reprisal, fled to America with a letter of recommendation from Paul Broca, sailing on a slow boat so that he could learn English on the way. There too he failed to secure an academic position and eked out a meagre living by teaching French and Medical Jurisprudence, and by conducting deliveries. He lived and worked in penury, surviving on coffee to economise, often labouring from 3 AM for up to 18 hours at a stretch. In 1854, Brown-Séquard secured the Chair of Physiology at the Medical College of Virginia, Richmond, but this first major academic appointment proved awkward. To foster his experimental passion, he worked in squalid conditions among dogs, cats, guinea pigs, raccoons and frogs collected by his students from the city streets, and the noise from his menagerie was objected to by the citizens. As a teacher his English was poor and his lectures unintelligible; citing dissatisfaction with his academic responsibilities, he left within a year. The fact is that his anti-slavery stance was not welcome in the antebellum Southern States, especially as he was considered, by social conventions prevalent then, coloured. He has been criticized for animal experiments conducted without anaesthesia, and is quoted as saying, "I am selfish enough to prefer mankind to frogkind, rabbitkind, etc." As a result, he was attacked, at least twice physically, by anti-vivisectionists. Today, we would condemn some of his techniques as needlessly inhumane, but it is essential to remember the prevailing ethos. His exoneration is in that he did not even spare himself at the altar of research, and was not averse to hazardous self-experimentation. He would swallow sponges with strings attached and pull them up out of his stomach to analyze gastric juices and digestion. To support his opiate regimen for cholera, he swallowed the vomit of a patient and then nearly overdosed on laudanum. He once covered himself in waterproof varnish to study sweating and recorded objectively in his notebook that he was “beginning to die”, before a student rescued him using sandpaper. Tellingly, his saviour was heard to wonder aloud whether he had saved a “crank”. Sadly, Brown-Séquard lives on in popular memory mostly for the unfortunate folly of his final years. In 1889, he announced the results of experiments conducted upon himself whereby he claimed to have reversed senility. He injected extracts of guinea pigs’ and dogs’ testes mixed with seminal fluid and testicular blood into his own arm over three weeks and noted rejuvenation of most bodily functions in himself, with similar benefits in volunteers. He reported this in the Lancet, but stressed the need for further confirmation. Today we can see that any effect would have to be as a placebo as testosterone is very poorly soluble in water, but this lay the groundwork for the consideration that ageing is, at least in part, due to hormonal deficiency. In order for further tests to be carried out, he offered his extract for free to physicians in exchange for scientific data. This was sensationalized as the “Elixir of Life” by the lay press and a cottage industry of 12,000 physicians dispensing “Sequarine” sprang up with predictable results. The ridicule that ensued, in the form of satire, lampoons and cartoons, resulted in his being denounced as a doddering embarrassment by the medical fraternity. Was this a last senile surge of forgivably misplaced ideology (as patronizing encomiums make it out to be) or was Brown-Séquard really on to something? To understand this, we need to realize that, back then, hormones were as yet unnamed, let alone identified or extracted. If one postulated an ‘internal secretion’ from glands in the blood or the tissues, the only way to transfer it would be to implant or inject the recipient with donor tissues considered rich in it. Brown-Séquard theorized that senility was the result of decrease in a yet unidentified ‘essence’ which he sought to replenish in the only manner tenable at that time, injection of animal tissue extracts. Indeed, hormonal supplementation today is little more than a refinement of what Brown-Séquard did. With regard to the physical improvement Brown-Séquard felt in himself, it was no doubt a placebo effect, the psychosomatic basis of which is well-established today and even exploited in therapy and research. Unfortunately, this blew up into a sensational controversy with him caricatured as a crazed doctor in cartoons involving monkeys and old men. Scientific American even issued a clarification supplement in his defence, but to no avail. The jealousy of academic peers and the bourgeois passion for iconoclasm took their toll, and this one gaffe seemingly negated a life-time’s scientific achievement, indeed a corpus worthy of several lifetimes. Indeed, but for the backlash, Brown-Séquard, ever the neutral experimentalist, would likely have introspected on the health benefits that he honestly felt, and might have propounded a field-advancing theory on psychosomatic manifestations of disease and cure. Unconscionably, Brown-Séquard is remembered as a Dr Frankenstein type meme, inspiring a host of mad scientists in English and French fiction, notably in Robert Louis Stevenson’s “Strange Case of Dr Jekyll and Mister Hyde”. This is not strictly true: Stevenson’s wife mentioned two sources for her husband’s inspiration, a treatise on dual personality and a nightmare. However, since they were neighbours in London, the house at 25, Cavendish Square, with its macabre dissection theatre and assortment of experimental animals may have had an influence. Brown-Séquard died of cerebral stroke in 1894, a dejected and disillusioned man. His tomb is a bleak granite obelisk at Montparnasse cemetery in Paris. Till the mortal end, he reported on his symptoms in letters to friends, even as he crawled to and fro on all fours between deathbed and writing desk. His was a lifelong career in research that could be stopped, literally, only by death. Writing this in Mauritius on the bicentenary of his birth, I am dismayed at how little Brown-Séquard is known in the country of his birth. Because of the unusual political status of Mauritius as a francophone British colony, he was acculturated in French, learning English only in middle age on a ship to America. Eventually he was naturalized to French citizenship for convenience, expressing dismay at this in a letter. However, his frequent returns to Mauritius, especially at tumultuous times in his career, suggest that he was always at heart a son of this island nation, and remains the best known of all Mauritians in the world, even two centuries after his birth. 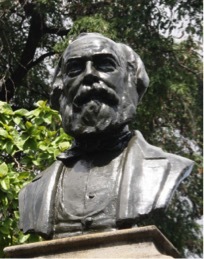 A bronze bust on a pedestal at the Jardins de la Compagnie in Port Louis, the Mauritian capital, is the only statue of Brown-Séquard in a public place. Apart from a number of streets in various towns and a mental hospital, there is little to commemorate his name. His birth centenary was forgotten in the throes of the First World War, though a stamp commemorating his death centenary was issued in 1994. In the summer of 2015-6, an exhibition was organised to commemorate his life and achievements. There is however a sad lack of memorials in the rest of the world. Nondescript streets in London and Paris and a scattering of dusty plaques in dark halls of academe bear his name. And, of course, every textbook on physiology and neurology. Charles-Édouard Brown-Séquard is Mauritius’ most famous son. No Mauritian ever, none whatsoever, is better known to the world. Only, many of us, in Mauritius as in the rest of the world, seem unaware of whence he came and what he left. Note: Some rights reserved. The materials of this electronic journal are copyrighted © by Dr. Arun Kumar Agnihotri “A K S Publication”. No part of this publication may be reproduced by any means without the written permission of the copyright holder. The readers of this journal are free to download, copy, print, distribute and display the work provided; they must give the original author credit, not use this work for commercial purpose, and not alter, transform, or build upon this work.